The Phoenix 98510 Easy-Up Manual Treadmill is a lightweight and very compact treadmill designed to be used around the home. It features a clever spring mounted pin locking system that makes set up and packing away super quick. Unlike powered treadmills, and even some manual treadmills, the Phoenix Easy-Up is super quiet, making it a great choice for around your home. No motor. The Phoenix Easy-Up manual treadmill has a weighted fly-wheel that responds to changes in your running or walking speed. The faster or slower you go, the fast or slower the belt will go, until it matches your natural speed. A single button electronic console (powered by two AA batteries) that can track your speed, distance, time, and calories burnt. A spring loaded pin that allows the treadmill to be securely locked in place when in use, but quickly and easily folded up, making assembly and storage as easy as possible. One of the big pros is that the Phoenix Easy-Up is super quiet, due to having no motor whatsoever. 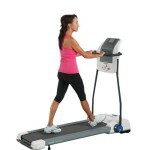 This makes it popular for people who want to use the treadmill while doing other things like talking on the phone, or watching television. Additionally, people find the Phoenix Easy-Up incredibly easy to put together, with little tools and time required. Setting up and packing away the Phoenix Easy-Up is also very, very, quick and reduces the time it takes from inspiration to work out. The console is easy to use and include storage/holding space for things like a water bottle, small towel and an digital music player or your phone. People also love the narrow size, which does not impact on the width of the tread. 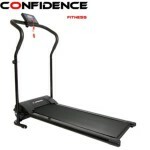 This makes the Easy-Up a great treadmill that doesn’t need to be folded up all the time while being able to fit in places many other treadmills can not. Being a manual treadmill means that you need to get the treadmill going. And a lot of people complain that this is not as easy to do as it is with other manual treadmills. There was a bit of a learning curve to being able to master the tread on the Phoenix Easy-Up. Additionally, to start with, you need to hold on to the frame in order to be able to “push off” and get enough momentum happening. With the incline many people found they had to maintain at least one hand – often two hands – on the frame at all times to remain stable, limiting the ability to get a upper body workout through arm movement. The Phoenix 98510 Easy-Up Manual Treadmill is a good choice for people looking for a quiet, manual treadmill you can easily use in your own home. The narrow profile means it can be left up a lot of the time and fits in really narrow spaces. 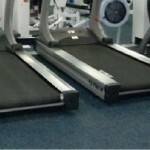 However, even for a manual treadmill many people find the tread hard to get going, and it can take some time to master. Being on an incline means that for lots of people you had to always hold on to the frame.